Ray Comfort is living proof that Abraham's god [AG] does not exist: the god who evolved from one of the 70 children of El to the one god of the universe: omnipotent, omniscient, all-good; creator of everything, tracker of who's been naughty and who's been nice, and rewarder (with eternal bliss for the nice) or punisher (with eternal torments for the naughty). There is one minor flaw with the argument from the existence of Ray Comfort to the non-existence of AG, and I will get to both the argument and the flaw shortly. First, I should note who Ray Comfort is for those who haven't heard of him. Comfort is a young Earth creationist, fundamentalist Christian evangelist, zealous anti-evolutionist, and author of such blockbusters as You Can Lead an Atheist to Evidence, But You Can't Make Him Think. He was born in New Zealand, but currently lives in California. One of his more notable publications is the introduction he wrote for the 2009 publication of Charles Darwin's Origin of Species (1859). Comfort has a reputation for scientific and historical ignorance, so it is no surprise that his introduction is a compendium of lies, errors, distortions, personal attacks, and plagiarisms. According to his website on what he calls The Origin into Schools Project, Comfort has given away 194,000 copies. 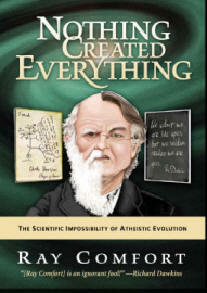 He says: "Nothing has been removed from Darwin’s original work." However, Eugenie Scott, executive director of the National Center for Science Education, says he deleted four chapters by Darwin that describe the evidence for evolution. When confronted with this fact, Comfort admitted he had removed the chapters, but claimed that his selection was random and done to save money. Now to the proof that AG does not exist from the mere fact that Ray Comfort exists. One of Comfort's more egregious misunderstandings of evolution is his idea of how species emerge. He and many other anti-evolutionists who have never studied scientific evolution believe that evolutionists think that new species are literally borne by other species. 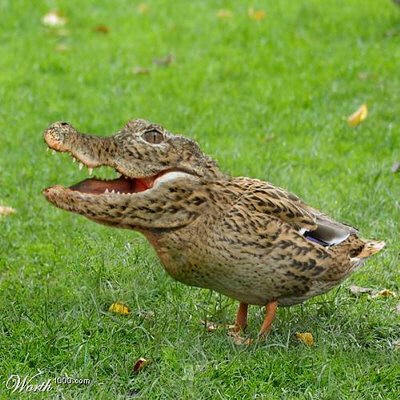 They think it possible for, say, a chimp to give birth to a human or a crocodile to give birth to a crocoduck. When that happens, some of the more obtuse creationists say, they'll believe in evolution. No evolutionary scientist believes one species ever gave birth to another species. Every animal that has been born has been borne by a mother of the same species. As all but some obtuse creationists know, offspring are not identical to their parents. Some of the variations in offspring might be more beneficial than others in terms of survival and reproduction. Over time, an accumulation of variations in a population may result in a new species. It should go without saying that for those creatures that do not give birth, evolutionary biologists do not claim that any have ever produced a new species in a single replication by whatever process. Comfort and his ignorant comrades falsely claim that evolutionary biologists think that transitional species occur in a single generation. That is not a view evolutionists hold. There are transitionsal species--the so-called missing links--but they occur many generations apart from the species they evolved from and into. Comfort, however, has a different notion of what evolutionists claim. Comfort thinks that evolutionists claim that the male of a species might evolve independently of the female of that species. He is, of course, arguing against a straw man, since no scientific evolutionist ever believed such an absurd notion. His argument does serve a purpose, however. It proves that AG does not exist. Imagine being there when the first dog evolved. Let's say it's the African hunting dog (Lycaon pictus), the wild canid of Africa. There was a big bang, and millions of years later an animal with a tail and four legs, a liver, heart, kidneys, lungs, blood, ears and eyes evolved (through natural speciation) into the first dog. Fortunately for him, his eyes had evolved to maturity after millions of years of blindness, so that he could see the first female dog that had evolved standing by him. It was actually very fortunate, because if the female dog hadn't evolved also and been at the right place at the right time, with the right parts and the willingness to mate, he would have been a dead dog. He needed a female to keep the species alive. Comfort puts forth many similarly false and ridiculous claims as if they were real ideas in the scientific community. He then ridicules the ideas and concludes that evolution is absurd and his beliefs in talking snakes and other Biblical wonders are true. Think about it. A man claims to prove an omniscient, omnipotent being exists by providing a series of inane, false, demented ravings. He claims to be living proof of an intelligent designer of the universe and to be his spokesman on Earth. If such a being as AG did exist, he would annihilate Comfort for making people think that AG is a moron. Comfort has not been annihilated. Therefore,AG does not exist. Case closed. Some people may say that AG is beyond our ability to understand and that what we think is bad, unintelligent, etc. may actually be good, intelligent, etc. and vice-versa. So it is possible that there is a flaw in my argument: perhaps AG is a moron and is actually pleased by the work of creatures like Ray Comfort. 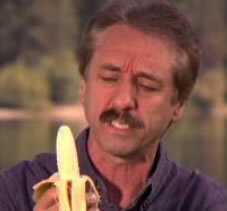 Ray Comfort is the Ben Stein of televangelism. 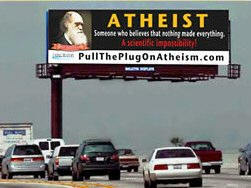 He once spent $6,000 for one month's rent of a billboard in Southern California on Interstate 105.
update: August 2013. Comfort has come out with a follow-up to his 2009 publication of Darwin's Origin of Species--the one that omitted the four chapters where Darwin presents the evidence for natural selection. As noted above, Comfort claimed of his version of Darwin's magnum opus that "Nothing has been removed from Darwin’s original work." So, it should not be surprising to find Comfort once again lying for his god. From his own description of his latest project I think he may have topped his own capacity for delusion and deception, which was nearly infinite to begin with. See also the missing link and Ray Comfort's stunt.